SKU: N/A. Category: Medical. 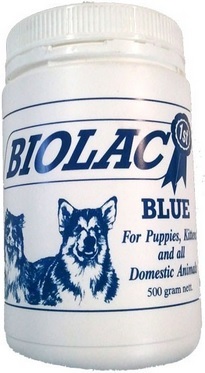 Tags: Biolac Blue, Puppy And Kitten Milk Supplement. BIOLAC® BLUE is a mixture of Milk Powders, Vitamins and Minerals formulated to assist in the growth and development of the young of all domestic animals. 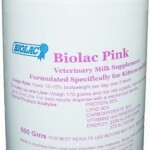 Biolac Blue is a mixture of Milk Powders, Vitamins and Minerals formulated to assist in the growth and development of the young of all domestic animals. Weigh 200 grams of Biolac Blue and mix into a paste. Add warm water and make up to 1 litre. For best results disperse with a mechanical mixer. Feed 10-15% bodyweight per day over 5 feeds. Refrigerate any remainder and shake before subsequent feeds.